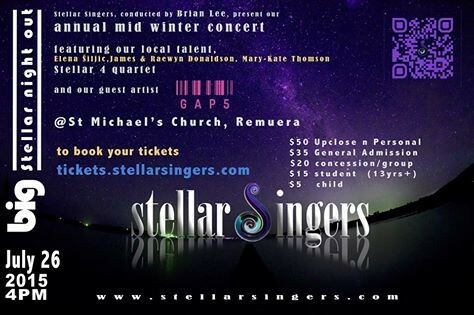 Auckland’s premier a cappella chorus, the Stellar Singers, under the direction of Brian Lee, will be in concert on 26th July at St. Michael’s Parish. This 30-voice chorus will perform a wide variety of music including jazz, choral, gospel, and contemporary a cappella. Our singers range from 16 to 60+, are from all parts of Auckland, and are as diverse in our backgrounds and professions as we are in our repertoire. What we all share is a love for music, performance, and incredibly tight harmony. This concert will also showcase our other talents with performances by our in-house chamber group, the Stellar 4 barbershop quartet, soloist Elena Šiljić, as well as a special performance by Gap 5 – featuring our own Nica Israel. Come for a night of great musical entertainment and see what makes Stellar Singers so special.